Go 'dune bashing' (off-roading on sand dunes) during an adventurous 45-minute drive in a sports utility vehicle. You're taken to a desert camp for a barbecue dinner and sunset watching. Here, take part in a variety of activities including camel rides, henna painting, shisha tobacco smoking, a tanoura show, and a belly dancing performance. 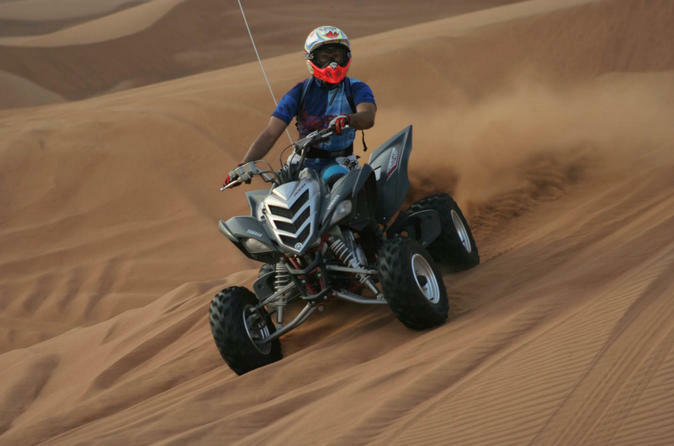 Round-trip transport from your centrally located Dubai hotel is included along with a 15-minute quad bike ride. Meet your driver-guide upon hotel pickup from central Dubai and settle into a 4WD SUV for a rollicking ride across sand dunes in the Arabian Desert. Along the way to a desert camp, your guide makes a photo stop so you can soak up the vivid colors of sunset. On arrival at the camp, you're served refreshments to accompany a barbecue dinner under the stars. Beforehand, make use of myriad activities on offer such as camel rides; shisha smoking via a hookah, or waterpipe; and intricate hand painting with henna, an impermanent plant-derived dye. Snap on a helmet and gloves and board a quad bike for a 15-minute ride over the dunes, and watch a mesmerizing performance of belly dance and tanoura (a form of Sufi dance). When your 6-hour evening concludes, you're transferred back to your hotel in Dubai.